Bio: Ria Hills was born in The Netherlands, raised in New York and now lives in rural Massachusetts. In 2006 she joined The Daily Painters in order to make small works more affordable to collectors. Ria is a member of the Connecticut Pastel Society and the Blackstone Valley Art Association. Her work can be found in private collections throughout the Americas and Europe. 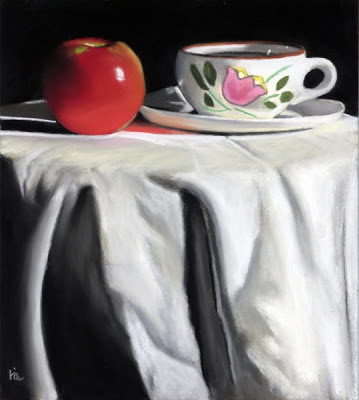 In December 2009 Ria was selected as a finalist in the still life category of The Artist’s Magazine 26th Annual Art Competition, chosen from 11,000 entries nationwide in the US. In February 2013 the Pastel Journal featured Ria’s work in a piece called titled “Food for Thought”, together with Lisa Ober and Karen Howard. Subjects: Landscape; figurative; food; pets. Style: Representational. Ria cites her influences as Georgia O’Keeeffe and Maxfield Parrish. Navigation: All links remain accessible at top of page. Gallery (click on the titles, not the images): Food Art; Still Life; Outdoors; Animals; People; Surreal; Buildings; Interiors; Florals; Oils and Acrylics. Image View: Thumbnails open in a pop-up viewer on the same page and can be viewed serially. Dimensions are not listed. Download is possible. Stangl Pottery is 539 x 600, 224 KB. Thank you for the post! I just found it. Hello Ria - glad you like it. Enjoy the other entries; I'll try to add more as I have the time.